I'm often asked how to make pizza. 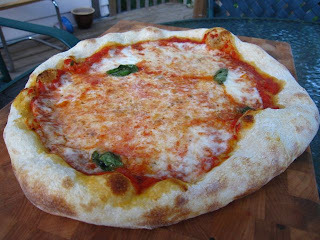 While I never mind sharing what I've learned, I've been hesitant to post a specific method online because there are so many other resources online for learning how to make pizza. But for my friends who do ask, it is useful to have a transcribed version of the often tedious-sounding recipe which I recite. It also serves as a complement to the myriad of pizza posts that I wrote back in 2007 when I was first learning myself. 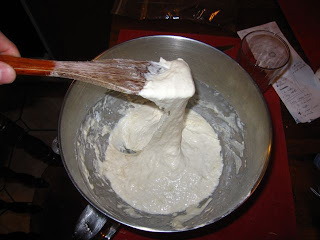 Combine all the water, 400g flour, and the yeast in a bowl with a wooden spoon. Cover with a towel and rest at least 15-20 minutes. This is called the autolyse and it helps develop the gluten without overworking the dough. The autolyse is important if you're using a machine to do your kneading; if you're kneading by hand skip this and mix all the ingredients at once (it's very hard to over-knead by hand). See how the wet dough stretches? That's the gluten holding it together. 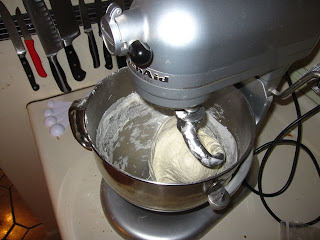 After 20 minutes, begin kneading the dough with the dough hook attachment of a stand mixer (speed #2 on the KitchenAid mixers). Add the salt, olive oil (if you want), and the sugar or honey (if you want). I've yet to detect what difference the oil makes, and the sugar is mainly to help the crust brown. However, the yeast eat it and if you age your dough long enough, it probably won't make a difference. Develop the gluten: as you mix flour and water, protein strands in the flour called gluten get stretched out and make the dough elastic. It's how dough stretches without tearing, and how it traps the bubbles of CO2 produced by the yeast. If you use a machine to knead, it's possible to over-knead to the point where you ruin the dough. 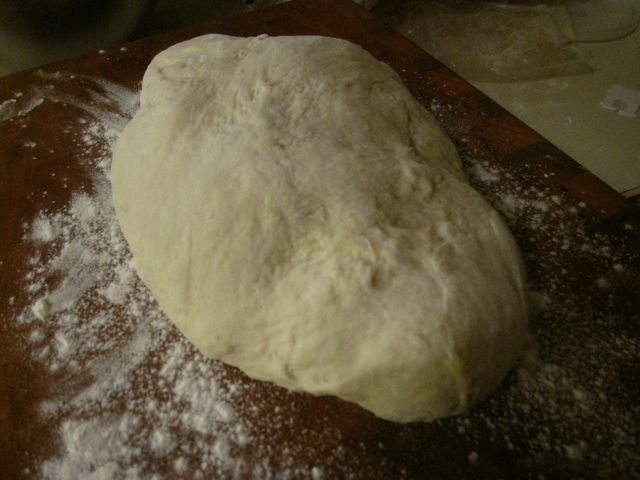 Gluten develops easier when the dough is wet because there is more water to let the gluten move around. So that's why I knead early while the dough is wet, and only gradually add more flour in. I usually add some of the flour, wait 2-3 minutes, and continue slowly adding flour. 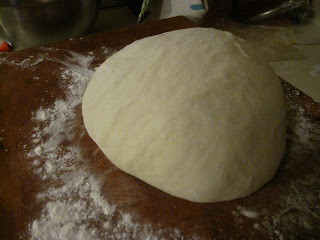 Eventually the dough will pull away from the sides of the bowl, but it will be very rough. Knead for another minute and it will smooth out. You can add more flour but not too much; if it's cleaning the sides of the bowl you're just about done. I rarely use all my four. The dough may look rough still, but let the dough rest for 5 minutes and give it a quick knead. You'll notice the rest made it much smoother. Give it the "windowpane test". 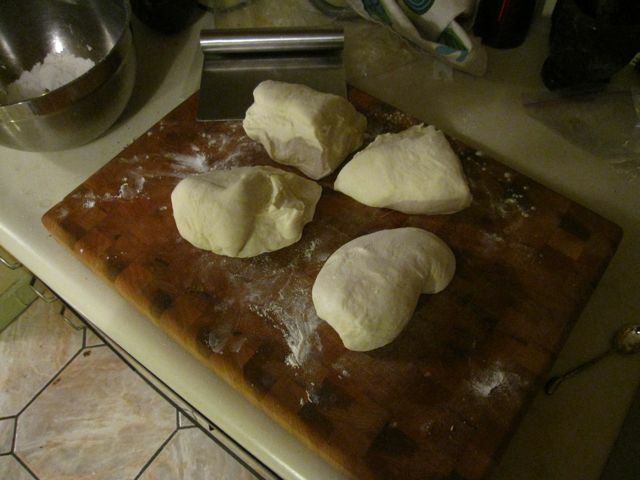 Cut off a small piece, dust it in flour, and gradually stretch it out like a mini pizza. If it stretches without tearing, you're done kneading. If not, knead for 2 more minutes, rest 5 minutes, and try again. But don't worry too much about the windowpane test--your pizza will still taste good. This recipe makes four approximately 12" pizzas. Weigh the dough and divide by 4. 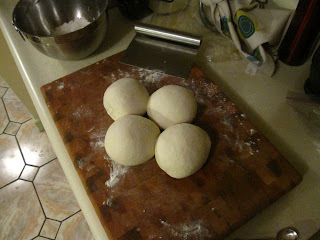 Then cut the dough into 4 pieces and scale them so they're all the same weight. Knead each future pizza by hand into a ball, and store in a plastic container brushed with oil. Into the fridge they go! A note on rising:Commercial yeast is bred (pun intended) to rise really fast. But what's really important in bread is depth of flavor which can only come from a prolonged rise. 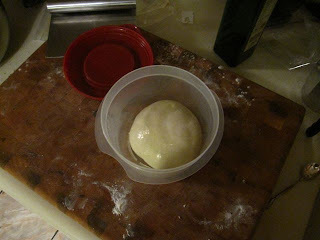 Wild yeast like the one I'm using works much slower so it's much easier to prolong the rise. To prolong it even more, my dough rises in the refrigerator, which besides developing flavor, allows me to make the dough ahead of time and use it later in the week. Speaking of wild yeast, I developed mine from scratch using a method from a bread book. There are many myths and legends and a few facts available online about yeast starters. If you're serious about starting one, check out a book or look at mine. Even easier, borrow some of my yeast. Once you have a healthy starter, maintenance is easy. Keep it in the fridge, and 1-2 days before you make dough, take it out, discard most of it, and add flour and water and mix so that you've at least doubled it. In 12 hours it should be risen and bubbly. Discard half and double again with flour and water. After the second feeding has risen, it's ready to use in your recipe. I would wait a minimum of 2 days and up to about a week before using the dough. On the day you want to make pizza, take out the dough about 1-2 hrs before you plan to eat. About 45 minutes prior, turn on the oven to 550 with baking stone inside. To prepare the pizza, take one dough ball out and dip it in a bowl of flour. Gently flatten it out into a disc and use your hands to stretch it. When it's bigger, you can use your fists to stretch it as thin as you'd like. Don't roll it, it's too harsh and you'll squash all the bubbles. 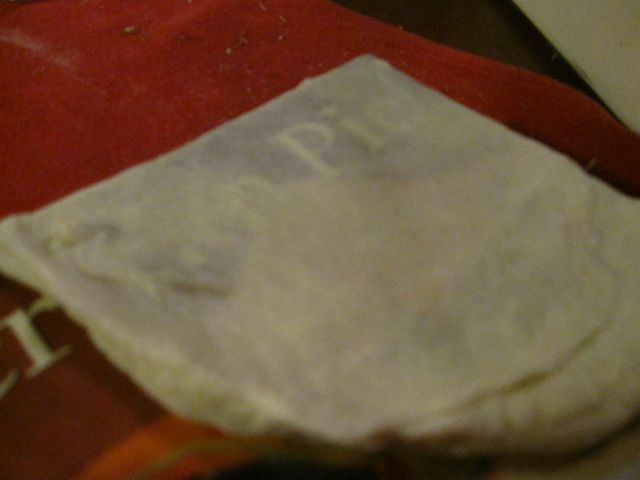 If you have a pizza peel, flour it and put the pizza on that. Add the toppings and slide into the oven. If you don't have a peel, put your pizza on parchment paper and slide it in the oven using the back of a cookie sheet like a big spatula. In my oven, it's done in about 6 minutes, but your mileage will vary. I never cook a sauce. I use canned whole Italian tomatoes. Remove the seeds by picking each tomato up and bursting the seeds out. Shake it around in the juice from the can to wash off most of the seeds. Put the pulp in another bowl and discard the stem. Eventually you'll be left with a bowl of juice and seeds, which you should strain. Blend the tomatoes so that there are still some chunks left, and strain it with a fine mesh strainer to remove some of the liquid. A clear liquid will come out which you can discard--this thickens the tomatoes without cooking them down. Just strain to your desired thickness and season with salt, herbs, olive oil, and a splash of wine. Then it's ready to use on your pizza. A pre-cooked sauce will not taste nearly as bright and fresh as this method. And don't go overboard on the toppings: balance and moderation is key. I like your passion for the process.